These designs remind me of plans I used to design when I was a child and full of imagination. Though obviously these are more viable. That’s part of the creative process I believe. The trick is making sure it’s structurally sound and livable and practical to build. on January 29, 2011 at 12:53 pm Kim T.
Wow! Love this! Its my new dream home away from home. I have the land, just need the time now. Glad you like it. This is now one of my favorites. I think curved buildings are the most livable. They feel great. Plans are available through DreamGreenHomes.com. I don’t think he’s added yet, but he will soon. My earthbag book will be available in about one month. I’ll include it free with all plan sales. We can post an announcement for free on our Bulletin Board at EarthbagBuilding.com and try to attract a trainer for your project. Am I correct in thinking that it is self-sufficient? I noticed the cistern and the planter on the south side, on Spiral Dome Magic 2. I have been researching the option of building an Earthship, because of its self-sufficient, off-grid potential, but I definitely prefer the organic forms of Earthbag buildings (as well as the lower cost and ease of build). Do the plans include any indications for getting the building off-grid (solar power, water collection and treatment, etc.)? Many of my designs, including this one, can be turned into self sufficient homes. Every feature of earthships can be built into earthbag homes at lower cost and less labor. But I don’t show every possibility because there are so many options. The best approach is to do the necessary research and adapt the design to meet your needs. My husband and I were wondering what the ladder in the dome is used for? It goes to the loft. I updated the plan description for clarity. This is my favorie design I have come across so far. We would also like to put earthship concepts into this plan. Has anyone used a combination of tires and earthbags in a structure that you know of?? You could use one or the other or even both, but tires have no advantages over earthbags. Earthbags are way faster and easier. I always tell people to try a test sample of each to see for themselves. I estimate earthbags are about 10x faster once you build up your skill. Millions of sand bags and other poly bags get thrown out every year, so there’s no reason to use tires. Search our farmers, breweries, etc. for recycled bags in good condition. Make sure they’ve been kept out of sunlight. Test a few bags before buying them. Any advice on how to incorporate earthship systems into the magic design? we really like the having a large grow area like the earthsip global model. Take a look at my Zero Energy plans and the recent Solar Pit House. Let me know what you think and then we can discuss the possibility of a custom plan. I like the solar pit design better than the zero energy ones. But my favorite is still the spiral. The boyfriend might like to solat pit as it seems closest to what he likes from the earthship global models. I have a smaller, one bedroom version of the Solar Pit House. The whole back portion is removed and the bathroom, laundry and mechanical are moved to the right side. We would prefer two bedrooms. The solar Pit is good I just tend to like the more curved and rounded shapes. lol. Not sure why. I’ll run it past him and see what he thinks. If the want the Earthship systems would it be best to choose something besides the Spiral? Would it be too costly and time consuming to modify them to work in the Spiral Magic? What about adding extra rooms to the Earth-bermed Earthbag House? I won’t charge extra because I like the design and haven’t finalized it yet. It’s far better to find a design that only requires a modest amount of changes. I really like this plan! Way to go! I have a quick question. 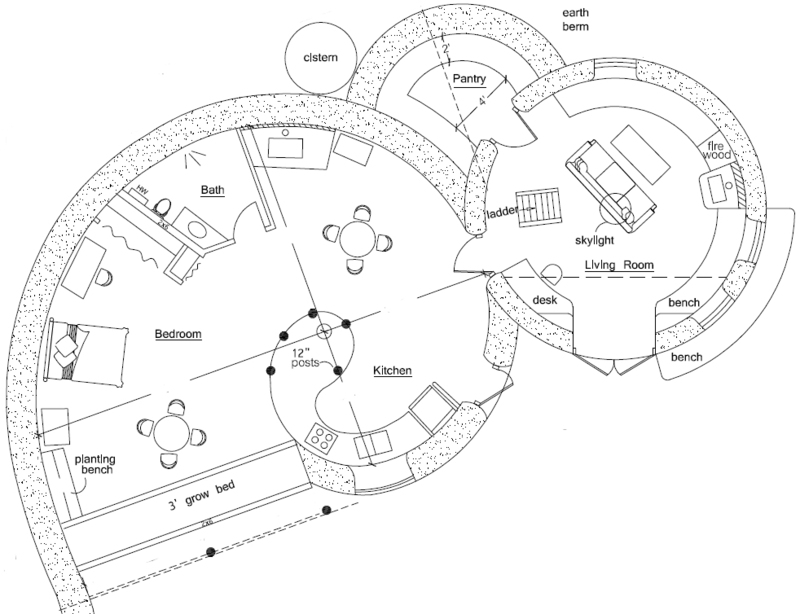 Is the pantry of this plan a cool pantry like in the Spiral 2 Earthbag house? If not, could it be made into a cool pantry? 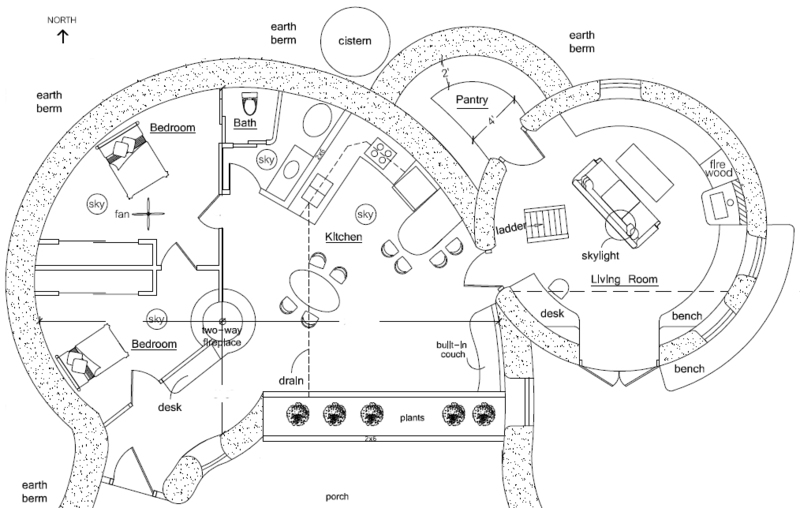 What about incorporating a root cellar into the plan, is that possible? Yes, they’re both cool pantries. Cool pantries have low humidity. Rootcellars have high humidity. So you have to decide what you’re going to store. Or you could build both. Does this come with a plan for the cistern? Or do we have to buy that separately? You can add all sorts of features like cisterns if you want. Up to you. Is it possible to start with just the peace dome and as money becomes available to add of the rest of the house? It’s a stunning design and pretty much has everything I would possibly want, including a living roof! PS: Such a fan of your work! I’ve been spreading the news to all my friends and they are so excited about how beautiful and fantastical the designs are. Thanks. Sure, you could start with the dome. You would have to plan ahead and think through all the details. For instance, you would want to build a stepped buttress where the dome and spiral house will join. Our blog has the details on how to do this and virtually everything else. That is good to know! Thank you! I was also wondering if it is easy to move the kitchen and bathroom over to the spiral house without leaving much of evidence that plumping was actually present in the dome. Also I read that in colder, wetter climates it is a good idea to place a roof on the dome but I prefer the aesthetics of a “naked” dome.Is it possible to use a plaster that is more resistant to cracks in these conditions? I live in the north-east United States. Again I really appreciate your feedback and I can’t wait to get started! Domes evolved in desert regions. High rainfall areas and areas with freeze/thaw cycles as the northeast are risk of moisture damage. All plaster cracks a little, and eventually water will get down in the dome. Search our sites for roofed domes. It’s not difficult moving things around if the main walls don’t change. Oh ok…I saw on youtube that one builder covered the earthbags with asphalt before using plaster. Was the intention to keep moisture out? Thank you for all your help! People do all sorts of things to try to resolve the inherent moisture problems of domes in rainy/snowy climates. Doesn’t mean all these attempts will succeed. What happens when water gets through tiny cracks in the plaster and hits the asphalt? It will freeze and expand and burst the plaster off. It’s best to ‘design out’ problems so they never occur in the first place. That is too true! Well, I will definitely take your advice on the roof. Thank you! Your Spral 1 Magic floor plan fascinates me. I can just imagine opening the floor to ceiling glass patio doors from the bedroom first thing in the and sitting on the porch with a freshly brewed coffee watching the ocean whilst admiring the aroma of fresh herbs in the aquaponic grow bed. The photo of the design appears to be a little out of sync with the floor-plan. do you have an updated photo of what the Spiral 1 Magic might look like, or maybe I can draft one up if you let me know what software you use. Definately my favourite, until I have the money for the Torus!